Sam Wilson's never been one to turn away from a fight but he may be taking on more than he can handle as the new Captain America. From publicly opposing SHIELD's reported plan to use Cosmic Cube fragments to secretly alter reality to protecting illegal immigrants from human traffickers, Sam's been stirring up controversy in the press with his every action. But when he backs the work of a secretive whistle-blower known as The Whisperer, Sam will find himself fighting the man he respects most in the world - Steve Rogers! You can say this for Nick Spencer - he is not one to shy away from controversy. Though his script is filled with metaphorically equivalencies, his real-world targets are clear. To Spencer's credit, he does not stand upon a soapbox but does allow for some reasoned discussion of differing viewpoints. 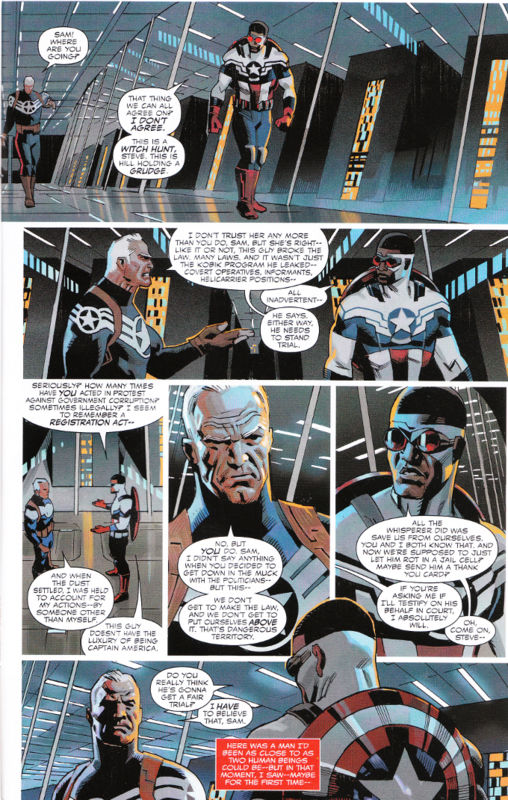 Of particular note is the discussion between Sam and Steve Rogers, where Sam argues that sometimes you have to work outside the system to do the right thing while Steve argues that one still has to be held accountable to the laws regarding exposing corruption within a system. Whatever your opinions on the story itself or the politics involved, it cannot be denied that the artwork is top-notch. Daniel Acuna draws some powerful figures. 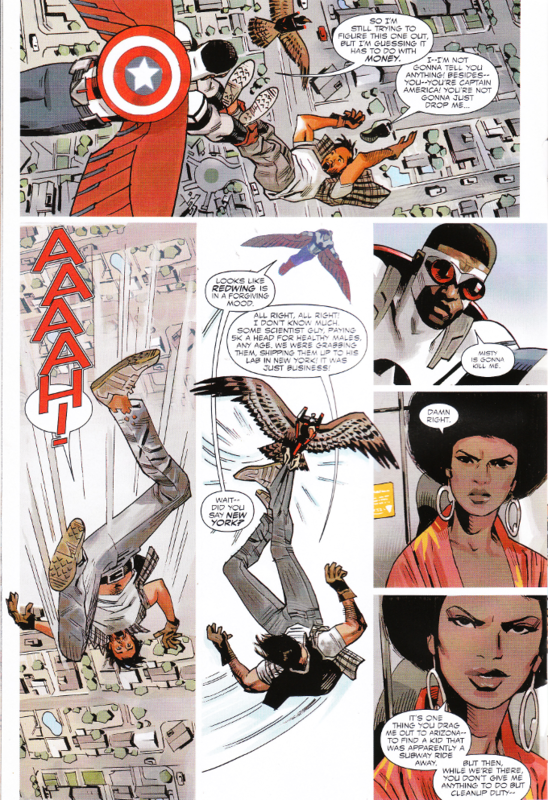 And his colors, mostly a variety of reds, white and blues, subtly reinforce the visual theme of the series.